by Leslie P. Michelson, Ph.D.
Nearly 35 years have passed since V.A. 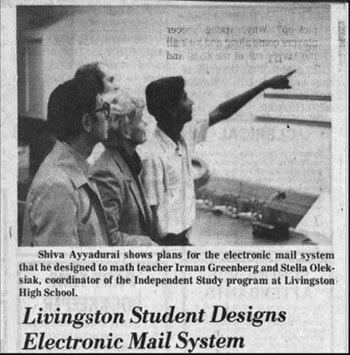 Shiva Ayyadurai invented email in our Laboratory in 1978. Shiva was a 14-year-old student then, and today he is an accomplished inventor, scientist and entrepreneur, who has continued to innovate many things beyond email, providing thousands of jobs across the world. In September of 2013, Shiva returned back to our Lab, still located in the same place, at 185 South Orange Avenue, Building C, Room 631 in Newark, New Jersey. It was there, in that Lab, that he conceived, designed and invented email, the email that we all experience today. V.A. 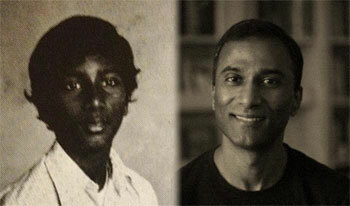 Shiva Ayyadurai: 14-year-old (left) and 50-year-old (right). When Shiva visited us in September of 2013, it was to announce, along with a representative from the Office of the Mayor of Newark, that he was launching Innovation Corps, a foundation to identify, recognize, mentor and support young people, between the ages to 14-18, who wanted to innovate things, small and large, perhaps creations even bigger than email. In 1978, we were very fortunate to have had the opportunity to work with Shiva. I was Shiva’s supervisor at the time. Today, we are pleased to share this Series on the History of Email to commemorate the August 30th Anniversary of Email. I’m honored to be part of this Series, and to have the opportunity to share my experience for various reasons. First, I hope to offer the reader a chance to hear from the proverbial “horse’s mouth” that, “Yes!” a 14-year-old boy, in 1978, did create a computer program that was the first electronic replication of the interoffice mail system (Inbox, Outbox, Folders, Memo, Attachments, Address Book, etc. ), which he named “email’, the world’s first email system. Email, the name of the software program he created, was more than just a simple “program” but a complete system --- it was the electronic interoffice, inter-organizational mail system, the first of its kind, an integrated platform that provided all the recognizable elements of the email, we all know and use today. My second reason for writing this article is to offer an appreciation of the ecosystem and environment, in which the invention of email took place at UMDNJ, particularly in light of the events that occurred immediately following the Smithsonian Institution’s acquisition, on February 16, 2012, of Shiva’s computer code, artifacts and papers. A vocal minority of industry insiders, who had profited directly and indirectly from falsification of email’s history for many decades, carried on a campaign of character assassination following the Smithsonian news. They even bullied journalists and editors, who shared the facts and wrote favorably about Shiva, in order to protect their economic interests. From my observation, what really incited these individuals was that the invention of email, in Newark, NJ, was shattering false narratives on when, where and by whom, innovation could take place. My third reason, perhaps the more important one, is to share, what I believe is, a much larger truth - that innovation, even as important as email, can occur anywhere, even by a 14-year-old boy, in Newark, New Jersey, if the right structure and resources are provided. Let us begin by providing you a background to the University of Medicine and Dentistry of New Jersey (UMDNJ) and our relationship with it. In 1975 the IT department of UMDNJ, then officially known as the College of Medicine and Dentistry of New Jersey, hired me, an experimental high energy physicist from Brookhaven National Laboratories, who had some general scientific computing experience and an interest in using minicomputers, the small computers of the time, to control and acquire data from laboratory experiments. 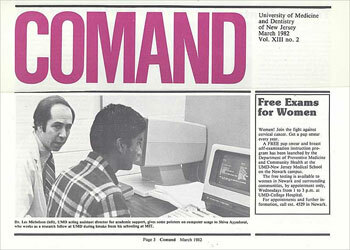 In 1978, UMDNJ, was a young organization, and prior to its establishment as a university of the Health Sciences in December of 1981, it was (and still is) a free-standing public institution comprising several medical schools, a dental school, school for the health related professions and a graduate school of the biomedical sciences. Absent were the STEM fields (science, technology, engineering and mathematics). Rather, UMDNJ focused exclusively on clinical and basic biomedical research and healthcare. 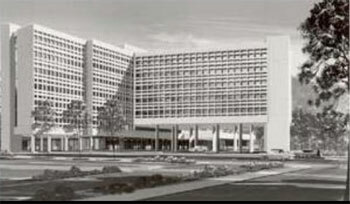 Having been signed into law in 1970 and comprised of the former Rutgers Medical School and the New Jersey College of Medicine and Dentistry, UMDNJ was establishing itself as a major academic health sciences institution. The IT department at the time, although small, included a scientific data processing group. The group was populated with several biostatisticians and mainframe computer experts. The staff interacted with faculty from numerous departments both in the clinical and basic sciences and became quite adept at introducing machine computation to life scientists, who, given their backgrounds and given the time period had little experience in using computers. Our main local computing device, an IBM remote job entry terminal, was connected to remote batch and time sharing machines operated by an educational consortium known as the New Jersey Educational Computer Network. Minicomputers made by Digital Equipment Corporation, Data General, Hewlett Packard and others were in fairly widespread use by 1975. They were used with growing frequency in disciplines ranging from nuclear physics to neuroscience. Medical equipment manufacturers were beginning to incorporate them as control and analysis elements in a new device called CAT Scan and they would soon give rise to a new generation of diagnostic instrumentation in which the rate of data acquisition and manipulation mandated the use compact computing hardware built into or adjacent to the instrument. We were connecting minicomputers directly to laboratory equipment to automate data collection and effect control systems in which real time analysis could influence the generation of electrical stimulus thereby helping to guide the progress of neurophysiological lab experiments. Other life sciences disciplines were similarly suited to this kind of automation. Although vastly less costly than mainframes, minicomputers were not inexpensive. Furthermore, we had several campuses on which to distribute the minicomputer resources including Newark, Piscataway and New Brunswick. These challenges led to the development of a network we called the LCN for Laboratory Computer Network, where more capable minicomputers were connected to one another and to smaller laboratory machines we called satellite nodes. The satellite nodes, more often than not, lacked a mass storage device -- they were very expensive at the time -- and depended on the larger nodes to boot their operating systems and applications. Today, there is a lot of effort underway to create innovation hubs or innovation centers. Our group at UMDNJ, far more modest in retrospect, provided an emerging ecosystem and environment for such innovation. We had the basic infrastructure, and above all were able to attract smart and dedicated people, curious and passionate, who wanted to explore new platforms. Though we ran the scientific data processing organization at UMDNJ, in a medical college in the late 1970s, it was frankly an unusual place to find the kind of experimentation that would lead to automation advances such as email that would change the way an important human-to-human communication paradigm would be mediated. Our computer hardware infrastructure at the time comprised mainframes, minicomputers and microcomputers. The microcomputer, while an exciting and clearly promising architecture, was mainly seen in industrial controllers and as a part of larger computer components. The microcomputer had also become an obsession for many computer hobbyists. The IBM PC and subsequent wide spread adoption of desktop computing was still a few years away. Standardized networks as envisioned by the National Science Foundation’s NSFnet and its commercial successor, the Internet, were almost a decade away. The predominant use of computers at the time was administrative business processing, scientific calculation and machine-aided design for engineering problems. However, while the role of computation in the broader context of human endeavor would lie in the distance, our hope was to explore such areas. So, we were open to finding others who wanted to participate in such exploration. We had resources, space, a network and computing power. Our team included the late Phil Goldstein who was an early innovator in the educational use of time-sharing systems; Robert Field, a database programmer; and Marilyn Bodow and Tina Brezenoff, statistical programmers in our group, who were looking to provide better interfaces for broader use of statistics packages. Dave Ritacco, a wunderkind studying engineering at the Stevens Technical Institute, also began working with us to develop user interfaces for graphics systems, predecessor to modern day presentation graphics. It was in this environment that we met Shiva. 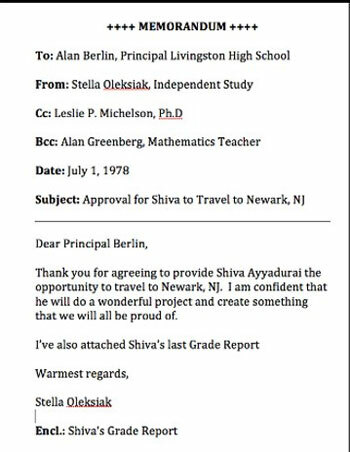 In 1978, a colleague, Martin Feuerman, from our parent IT organization approached us to ask if we would spend some time with Shiva, a 14-year-old high school student from Livingston New Jersey. Meenakshi Ayyadurai, Shiva’s mother, told me that her son had just completed a special program in computer programming at the Courant Institute of Mathematical Sciences at New York University (NYU) for young persons who had demonstrated significant promise in mathematics. Our willingness to talk to Shiva, unfolded into an exciting diversion from the major focus of our work. Leslie P. Michelson (left) and V.A. Shiva Ayyadurai (right). By the time Shiva joined the LCN as a high school Research Scholar, a few of us were beginning to ponder the role minicomputers might play in the larger space of human interaction. We were obviously familiar with the nature of the simple interactivity between humans and machines -- after all, much of the software we developed to manage lab experiments required interactivity if an investigator was to be in the loop of experimental input and resultant response. We were also familiar with the methods and protocols by which computers could exchange messages with other similar types of computers. Our minicomputers, manufactured by the Hewlett Packard Corporation, were provisioned with subsystems that supported this type of communication. Human interaction was mediated through teletypewriters and relatively primitive CRT-based display devices. The age-honored interoffice memorandum, the “memo”, the primary modality of written human-human communication in the workplace was widely used at UMDNJ as it was everywhere else. The memo, regardless of the method of transport and retrieval has the general properties of one-to-one or one-to-many distribution and is easily filed to keep a record of a particular human discourse. 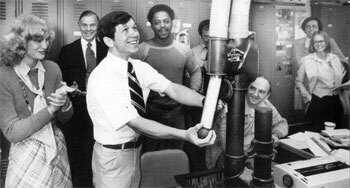 In 1978, as in decades earlier, the memorandum was delivered by hand or in the case of a campus or group of campuses, placed in a mailer and transported by an interoffice/ inter-organizational/ campus/ intercampus paper mail process, that including pneumatic tubes. It did not take long to recognize that Shiva was an exceptional student and to determine that we could challenge him in extraordinary ways. Although beyond the scope of our responsibility, we were eager to explore the use of small computers outside of the space of numerical calculation and experiment control. The notion of automating the entire interoffice, inter-organizational paper mail process to create a system was appealing for several reasons: It was a ubiquitous process, the mechanics of which, at least superficially, could be understood by anyone; the advantage of automation was obvious in that it would be possible to significantly collapse the time frame of transactions; and there were multiple ways in which electronic automation could extend the utility of the memorandum. As far as we knew, no one else in 1978 had attempted to take on such a task. The reader should be aware, that after the Smithsonian’s acceptance, on February of 2012, of Shiva’s papers documenting his invention at UMDNJ, it was Mr. Crocker, who led a vitriolic campaign across the Internet to brush aside and diminish the invention of email by Shiva at UMDNJ. For decades, Mr. Crocker and his ARPANET fraternity had conflated their contributions to email by crediting themselves as “inventors of email” by misusing the term “email” to refer to their work in Text Messaging as “email”. As the historical RAND report clearly shows, neither Mr. Crocker nor his colleagues at the ARPANET, per his own admission, had any intention to create email, the inter-organizational mail system. When Mr. Crocker’s RAND Report was found by MIT student researcher Devon Sparks, and released within the False Claims section on the web site http://www.inventorofemail.com, organized and edited by Dr. Deborah Nightingale and Dr. Sen Song, in 2012, Mr. Crocker, who I had no relationship with, contacted me and requested to meet me behind closed doors, likely to perform damage control as his contradictory behavior was being exposed. I declined Mr. Crocker’s request. The damage he and his ARPANET fraternity had done by being accomplices to the defamatory journalism, unleashed on Shiva, was beyond inexcusable. We hope that on the Anniversary of Email, Mr. Crocker reads his December 1977 RAND Report, and issues a public apology to Shiva, if he desires an authentic intellectual exchange with Shiva and me. So, for us in 1978, the creation of an electronic version of the interoffice, inter-organizational paper mail process became the object of our affection. This was a different perspective than Mr. Crocker and the ARPANET researchers, who chose not to attempt to emulate a full-scale inter-organizational mail system, and had deemed the creation of such a system impossible. We were confident that Shiva could do it. We sat Shiva down and offered him what turned out to be one of most innovative (and fun) projects our group was ever to undertake. In return, we demanded that this 14-year-old youngster channel all of his energies into the project. We made it very clear that he would be a full-fledged member of our team, treated as an adult and that we would expect nothing less from him. Livingston High School agreed to Shiva spending initially a few days a week and later to half-days at the Newark, New Jersey Campus. Shiva was eager to begin writing code -- after all that was the most fun. It was surprisingly easy, though, to convince Shiva that the code would just be a physical embodiment of the design. Although, we would need a working version, indeed a production model, the lasting contribution would be the systems analysis that we hoped would lead to implementation that was more than the mere automation of a manual process. We wanted to develop a sustainable logical and functional framework that would add significant value and lead to further innovation over time. Shiva’s first task was to learn how the interoffice memorandum was used at the University. Who wrote them and to whom? What was their place in the hierarchy of written documentation? What was the sender’s expectation of a reply? What volume could we anticipate? And, of course, what could we do to improve the utility of this modality? Surely, user would want more features as soon as they recognized this new potential. Could we be one step ahead? •	A simple user interface would require no specific computer knowledge and would provide access to all program features at the user level. Command lines are to be prohibited --- our users were life science researchers, clinicians and administrators, not computer scientists. •	The user interface would include a visual compose mode with spelling and formatting capability. •	Interoffice memos would be stored in a structure database and replicated on each node, which would also manage account and routing information. •	Only one instance of a message would exist on any one node until the last recipient elected to delete it or save it in another location. •	Each instance of the program would operate independently of the status of other nodes or the University’s local- and wide-area networks (such as they existed at the time). •	Delivery would be guaranteed. •	Attributes, considered to be part of a letter-based postal delivery system, such as return receipt requested would be implemented. •	A full management interface with account maintenance, environment status and debugging tools would be developed. •	The electronic metaphor of all the other elements of the interoffice, inter-organizational paper mail system would need to be incorporated: inbox, outbox, folders, memo structure, address book and other important features, that we now have in modern email systems. Our software tools were relatively primitive. A FORTRAN IV compiler with restrictive variable naming conventions and lacking intrinsic file system access; a non-relational, hierarchical database management system; and a simple networking environment that permitted static routing among nodes in a predetermined mesh. These tools ran on the HP1000 platform, a real-time environment not particularly optimal for the kind of development we envisioned. These impediments turned out to be of little consequence, but certainly upped the complexity of the programmer’s task and by some measure, Shiva’s accomplishment. In fact, the inflexibility of the development and execution environment turned out to be somewhat serendipitous. Our project combined the attributes of both the interoffice memorandum and paper mail systems. The FORTRAN IV compiler limited variable names to six characters. Moreover, the RTE/IVB operating system running on our HP1000 computers limited process names to five characters. Of course! Our new service was electronic and it combined many if not all of the characteristics of paper mail. I can attest that Shiva was the sole author of the entire EMAIL program and system. We released the first version in late 1978. The next year in 1979, he was paid $1.25 per hour and promoted to Research Fellow, and we continued to release new versions of email. A few years later, Shiva, obtained a Copyright for the program. Nearly 500 users used the system. The rest should be history. Shiva had written some 50,000 lines of FORTRAN code across more than a dozen cooperating processes that communicated within a node and across the Laboratory Computer Network. In those days, the total amount of memory to run the program on the computer was less than 64 Kilobytes! Shiva had to find clever ways to unload and load those processes, in a seamless manner. This was not easy, and required a great deal creativity, persistence and determination. We recall that on formal launch day, we filled a large lecture hall at the New Jersey Medical School with technical staff and other parties that were fascinated by the work Shiva had done. Here we were, all of these people: IT professionals, administrators, family and friends to learn what Shiva had done. Multiple screens and white boards filled with charts, “screen shots” and flow diagrams kept everyone‘s attention. There was a bizarre aspect that pervaded all of this. The presenter was not a distinguished scientist or clinician from UMDNJ or some other vaunted institution, but rather a very young man, a teenager, with a fascinating story of ingenuity and determination. There is much credit to spread around the vast community of academic, industrial and military researchers and engineers who eclipsed the industrial revolution with their contributions to computer science and computer and network engineering. We take no credit where it is not due. We will, however, stand firmly for the innovation that took place at a health sciences institution, an unlikely venue for the work we did. Our incentive was not fame nor fortune, but rather a challenge that arose from our own experiences and our desire to take on a challenge and place our faith on the resources of a 14-year-old student from Livingston, New Jersey, who was disciplined and found a way to come to Newark, NJ to work. There is a larger story here, one that should be evident by now. Innovation can happen anywhere, anytime by anyone. The sooner we embrace this truth, the sooner our lives will be enriched by the thousands of other “Shivas” that do not have the luxury of working in the established bastions of innovation, but nevertheless have the intellect and drive to make big contributions. Leslie P. MichelsonLeslie P. Michelson, Ph.D. is the Director of High Performance and Research Computing Division, Rutgers Medical School (RMS). In 1975, the University of Medicine and Dentistry of New Jersey (UMDNJ), now a part of RMS, recruited Dr. Michelson, a trained theoretical physicist from Brookhaven National Laboratories. His group at RMS develops solutions in the life sciences for research endeavors with demanding computational requirements. In the late 1970’s Michelson’s organization provided the challenge, resources and mentorship that led to the development of the first electronic interoffice memorandum postal system by V.A. Shiva Ayyadurai. 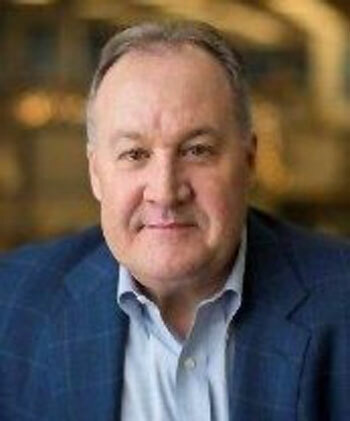 Throughout his career Michelson has been active in the support of the use of networking technologies to advance research and education interests in the State of New Jersey. He was a founder and served as the third president of the New Jersey Intercampus Network, the predecessor of the State’s Higher Education and Research Network, NJEDge.Net. What we know today as “email” is really a system - a system of interlocking parts, each of which is essential for ordinary people to communicate effectively with one or many others, in an environment where different kinds of information must be shared (memos, documents, files, etc.) i.e. the modern office environment. In 1978, I was a colleague of Shiva Ayyadurai’s at the University of Medicine and Dentistry of New Jersey (UMDNJ), located in Newark, NJ. Shiva and I worked together in the modern office environment of the 1970s, where information sharing, primarily through the printed-paper medium, was the modus operandi. Much of my effort at the time was dedicated to managing database software systems. Though Shiva was nearly 20 years younger than me, neither I nor the other Lab members thought of Shiva as a kid or a student. His professionalism, programming capabilities, attention to detail, and commitment to producing software that was user-friendly and reliable, was extraordinary. 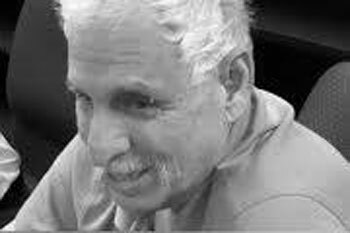 His supervisor Dr. Leslie P. Michelson challenged Shiva to create an electronic system that would emulate the interoffice mail system, then in use at UMDNJ. My interaction was one of being a sounding board for Shiva, time-to-time, on database functions and operating systems issues such as memory management. I recall, in particular, Shiva’s incredible persistence to face a technical problem head on, and to solve it. As a former colleague of Shiva’s, I hope my writing this article, as a part of this History of Email Series, provides details on the first email system created at UMDNJ in 1978. Many people over the age of 40, myself included, will remember the interoffice paper mail system, which was the basis of how offices around the world operated, from the level of secretaries to CEOs. The interoffice mail system had the following interlocked parts (as detailed in Table 1 below), which are the now-familiar components of email: Inbox, the Memo (“To:”, “From:”, “Date:”, “Subject:”, “Body:”, “Cc:”, “Bcc:”), Forwarding, Composing, Drafts, Edit, Reply, Delete, Priorities, Outbox, Folders, Archive, Attachments, Return Receipt, Carbon Copies (including Blind Carbon Copies), Sorting, Address Book, Groups, Bulk Distribution. The interoffice mail system was not only used across offices but also inter-departmentally and inter-organizationally, some referring to it also as the inter-departmental or inter-organizational mail system, respectively. In this article, we consistently refer to the mail system as the interoffice mail system. The interoffice mail system at UMDNJ was complicated, consisting of many components. In Table 1, below, is a detailed listing of the parts of the interoffice paper mail system, in use at UMDNJ in 1978, along with their detailed descriptions. If you took away any one component or part, such as the ability to attach other materials (Attachments) or the use of Folders or the ability to send Carbon Copies, your ability to function and communicate with co-workers was greatly impaired in the office environment. This is why it was a “system”, because you needed all the components to work together. The Parts and Detailed Description of the Interoffice Mail System at UMDNJ (1978). This was the physical Inbox where a secretary received incoming documents. It was usually made of wood, metal or plastic. The courier or “office boy” or “mailroom clerk” would deliver postal mail or interoffice memos into this Inbox. Deliveries into the Inbox were done at least twice per day. Sometimes, urgent messages were delivered on an ad hoc basis into the Inbox. This was a physical box made of metal, wood, or plastic, where outgoing postal mail or interoffice memos, which were composed, edited, an placed in an envelope, and addressed to the recipient, were made available for pickup and delivery to its recipients. A courier or “office boy” or “mailroom clerk” would come and pick up the items from the Outbox regularly, at least twice per day. This was a physical box made of metal, wood, or plastic to hold drafts of memos or letters, which were in the midst of being reviewed and edited. 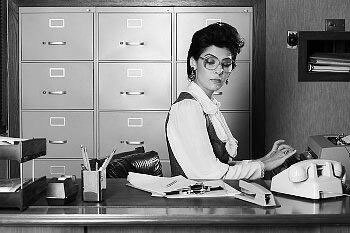 Typically, a secretary would write the memo and put in the Drafts box for review. A superior would then pickup, review and provide “red-line” feedback on the memo or letter, and place back into Drafts box. The secretary would retrieve the edited document, make changes, and place the edited document back in the Drafts box. After the superior gave instructions, the memo or document would be deemed as completed; the secretary would then place the memo in an envelope, and place it in the Outbox for pick up. Memos, documents and files were archived and organized in metal cabinets containing metal drawers. Within each drawer, one could organize, categorize and these items in manila folders within each drawer. A Typewriter was an instrument that allowed a person to create a Memo. It consisted of mechanical components corresponding to all the alphabets in the English language plus the 10 digits of the number system, as well as a number of other special characters. The Typewriter required paper and ink ribbon to convert strokes on the keyboard into letters on the paper. There were many styles of Typewriters, mechanical and later electrical. This was typically a piece of 8 1/2 by 11-inch piece of BOND paper. The top of the Memo had the words “++++++ MEMORANDUM ++++++” written on it and centered. Below, there were the following areas: “To:”, “From:”, “Date:”, “Subject:”, “Body:”, “Cc:”, “Bcc:” (only for view in the sender’s original), and another section with “Encl. :”, if Attachment(s) were included. After the “Subject:”, there was typically a horizontal black line, after which the “Body:” of the memo appeared. Below the “Body:” were the names of people on “Cc:” list, and then the “Encl. :” list, listing the various Attachments. A memo could have Attachments or enclosures such as another file folder, another document, a drawing or a photograph, or even a parcel. Carbon copies were copies of a Memo created by the secretary, who would typically place dark blue carbon paper between two Bond pieces of white paper and roll them into the typewriter, to create the copies. The Bond paper on top was the original, the paper below, was the “Carbon Copy” or “Cc:”. Sometimes, several Carbons were used, and sometimes if the “Cc:” list was too long, the original would be mimeographed on a mimeograph machine. Then, the original “To:” recipient would get the original, the top copy, and each person on the CC list would get copies. This got more complicated if there were multiple recipients in the “To:” field, or a Group in the “To:” field. Blind Carbon Copies enabled a secretary to send a Carbon Copy of a Memo to some people, that others on the “To:” and “Cc:” lists were purposely made to unaware, or “blind” except to the secretary who authored the Memo. The “Bcc:” list, in the header of the Memo, was kept by the sender/secretary, only, and others who got Carbon copies, those on the “Cc:” list, did not see e.g. they were “blind” to those receiving the Bcc’s. So only the sender knew who was on the Bcc list. In the office environment of the medical school and hospital at UMDNJ, this was a very important feature, because certain Memos had to be acknowledged as received. A Memo could be flagged as a “Registered Memo,” this would mean that it was treated differently. The delivery person would put it in a different color envelope and ensure that recipient signed a Return Receipt, before it was put into the Inbox. This would assure the sender that the recipient got the Memo. This was a formal receipt that a delivery person would make sure got signed by the recipient who had been sent a Registered Memo. This Return Receipt would then have to get sent back to the original sender. The interoffice envelope was typically a bit larger than an 8 1/2 by 11-inch paper, and was normally gray or yellow in color. The envelope had a red string on the outside so it could be secured for ease of opening and reuse. The outside of the envelope provided columns and rows on which the sender and the recipient could be listed. 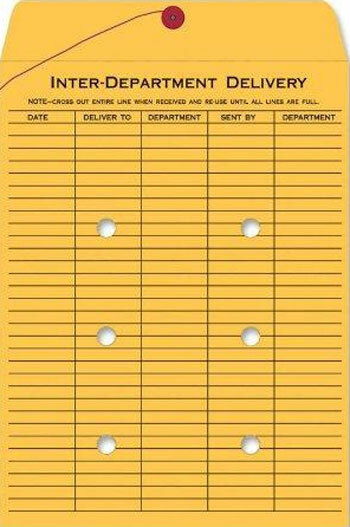 After a recipient received the envelope, they could recycle the envelope by crossing out the previous sender and recipient and using the blank rows to write the new sender and recipient, name and address. Every office had an Address Book, which listed each person’s first and last names, location, Group affiliation (e.g. surgery, finance, pharmacology), room number and phone number. The Address Book was the cornerstone of each offices’ contact list. A Group was listed next to someone’s name in the Address Book. Individuals could belong to different Groups. Groups included Surgery, Pharmacology, ICU, IT, etc. One nuance was that the Group names may be the same, but the Group was distinct based on the campus location. For example, the Pharmacology Group at one location may have different people, than the Pharmacology Group at another location. Each location had different people in different Groups. A Trash Bucket was typically next to a secretary’s desk on the floor. The bucket was made of either plastic or metal, and was the location of where trash, such as old papers, garbage were deposited. Composing a Memo was done by the action of taking a blank piece of white Bond paper and placing it in the Typewriter. Sometimes, if errors were made during time, a white liquid substance in a small bottle jar, colloquially called “whiteout was used to erase mistakes, and then the typing was done over the whited out area. Memo to an individual meant that the “To:” field had only the name of only one recipient. Scanning mail was the process of quickly reading the Envelope in the Inbox, opening the Envelope and quickly reading the top portion of a Memo, such as the “From:”, “Subject:”, lines to get a quick idea whether to read the Memo immediately, discard it into the Trash Bucket to read first, to put for later review, or sometimes to discard altogether e.g. junk mail. A person receiving and reviewing an incoming Memo in the Inbox could Forward or Re-Distribute the Memo to others. Forwarding literally involved adding a list of other recipients who to review the Memo. This Forward list was sometimes just paper-clipped on the received Memo, and as the forwarded recipients read the Memo, they checked off their name on the paper-clipped list, and passed it on to the next recipient, who had not yet read the Memo. This was an important feature to ensure receipt of a forwarded Memo by the recipient. Sometimes, an important Memo, say from a Director, would be received by a Manager, and that Manager wanted to ensure that certain employees in his group received the Memo. Forwarding with Return Receipt enabled the Manager to know exactly when and who got the Memo and who did not get the Memo. Prior to someone receiving the Memo in their Inbox, the delivery person, would not place the Envelope containing the Memo, it in their Inbox, until the recipient, signed the Return Receipt. The Return Receipts from each employee was sent back to the Manager, and thereby the Manager could the number of Return Receipts and know how many actually received the Memo. A memo sometimes would be edited after it was composed. Editing could be iterative based on the feedback received. Editing typically involved the use of whiteout or sometimes starting with new blank piece of paper and retyping the original Memo with the corrections. Editing relied on the use of the Drafts box, as this box served as the point of interaction between the secretary and her superior. Sometimes instead of writing a new Memo, an individual Replied to a Memo received in the Inbox. When they replied to the Memo, they could either simply send the response Memo or attach the response Memo to the original Memo sent from the sender as an Attachment for the originating sender’s reference. Sometimes a Memo would need to be broadcasted, or sent, to multiple recipients, sometimes hundreds, not just one individual. This involved listing multiple names of recipients in the “To:” field. The original Memo was created with the listing of all people’s names on the “To:” field. Then that original Memo was copied using the carbon paper to copy, if the list was small, or the original Memo was simply mimeographed. Then each copy was stuffed in an Envelope and placed in the Outbox. In a large organization, within and across facilities, there were different departments such as Pharmacology, Finance, Administration, Surgery, etc., and one may want to send a Memo to a department or Group. A Group involved a listing of many recipients. However, in the “To:” field only the name of the Group would appear. The secretary would then have to look up in the Address Book and print mailing labels for each individual in that Group, and send a copy of the Memo to each recipient; alternatively, sometimes only one copy of the Group Memo was sent to on address, and the recipient, the secretary or administrator of the Group, on the other end, would make copies of the Memo, and distribute it to members of the Group. Sometimes a memo would be thrown into the Trash Bucket for disposal. The contents of Trash Bucket, by request, would be collected and be destroyed. Address Books were updated as employees came and left the organization. New people were added, and those who had left were removed. Sometimes a circular was sent out which was the update to the existing Address Book, and one would have to manually insert the changes in an existing Address Book. When mail was left in the Inbox, it sometimes was sorted based on some priority, and marked, such as High, Medium or Low by the secretary. And some secretaries, had file folders, for sorting these three categories of Memos. Not all Memos were discarded after they were read. Some Memos were to be kept for storage, and were often put into an archive file cabinet and organized for long–term record keeping. Sometimes a Memo could not be delivered even after many Retries. In this case, the delivery person would take the Memo back to the sender with a note on it saying “Undeliverable”. All mail had to be delivered, or a real effort was made to keep trying to deliver it before being deemed Undeliverable. This meant a policy of “retries” as many as 3 to 5 times, before the attempts were stopped. The number of Retries was a policy decision of the organization. All mail had to be securely delivered. This meant that only the designated recipient had to receive it. Typically this was ensured, as the delivery person knew who was who and knew the secretaries. Moreover, Memos were put in an individual sealed envelope, with a string closure or taped, so they could not be easily opened during transit. All mail needed to be transported. There were many ways of Transporting. The delivery person could physically pick up the mail and deliver from local office to office, on foot. Another forms of transporting were using pneumatic tubes, in which the Envelope was placed. 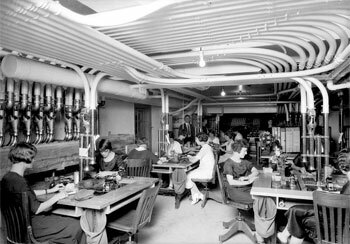 The pneumatic tubes were sent on a system of train-track-like rails, form office to office. Mail among different buildings and campuses was transported by cars or trucks. Different locations had mail Sorting facilities, where the mail would come in, be sorted by groups, departments, locations, zip code, office numbers, so the delivery was easier. Within each office, the secretary would also perform sorting operations by a memo’s priority, source, etc. If you did not know what the interoffice mail system was, before reading this article, I hope Table 1 was educational and provided you a detailed understanding of this paper-based system. Moreover, you will observe a near 1-to-1 correspondence with the parts of the interoffice mail system, itemized in Table 1, and the email system you are using today. In 1978, Shiva conceived and developed an electronic system that replicated all the functions of UMDNJ’s entire interoffice paper mail system, as itemized in Table 1 above. He named the system “email”, a name that, based on extensive document review, was first introduced and brought into use as his system spread throughout the UMDNJ campuses. This name was assigned to his program for both convenience and out of necessity since the FORTRAN IV programming language, which “email” was written in, required all variables to be in upper case and the RTE-IV operating system had a five-character limit for program names - thus, Shiva concatenated the letters “E”, ”M”, ”A”, ”I”, ”L” to name his program. In 1978, those five juxtaposed characters had never been used before in the modern English language. While this term may seem obvious to us today, in 1978, it was not. Table 2 provides a list of all the features that Shiva implemented into the first email system. As you can see, this system was not a “simple” system for just exchanging text messages. It was a full-scale version of the interoffice mail system in an electronic format. Memo Formatting – Formatting functions to make sure that a memo on the screen when printed looked akin to the typewritten memo. Restricting Group Access --- Particular users could send to certain groups. E.g. Only Postmaster could send to “ALL” for global broadcast. Email was delivered as one holistic platform, that integrated an easy-to-use interface, and a word processor, all built from scratch by Shiva, as well as a relational database (to support folders, archival, sorting and many other features not possible with flat-file based approaches), with a modular intercommunications protocol. In 1978, UMDNJ had four campus locations in New Jersey: Newark, Piscataway, Camden, and New Brunswick. Shiva and I worked out of the Newark campus. Workers on these campuses began using email as a public and commercially viable system starting in 1978, when we released the first version. At that time, any one who used a computer on the network, had to login. They were billed for hours of usage for the applications they chose to use. Email was one of these applications. Shiva solely built the entire system, nearly 50,000 lines of code, using a high-level programming language (FORTRAN IV) and HP IMAGE/1000 database system. He was the sole author of this email system, designing and writing all the code. Dr. Leslie P. Michelson’s article “The Invention of Email”, which is also part of this series, provides additional details from Dr. Michelson’s interactions with Shiva at UMDNJ. Unlike the developments on the ARPAnet, email was built to address a systems problem in the ordinary office situation using local area and wide area networks (LANs and WANs), where computers across offices and multiple campuses were connected --- independent of the ARPAnet. None of us in the Lab at UMDNJ had any contact with the ARPAnet. The first email system was meant to be a widely shared system of ongoing communication by ordinary workers, not computer scientists who knew code. Email was developed with a focus on user-friendliness and high-reliability, and deployed as a commercial product, where nearly 500 office workers accessed, and used it. 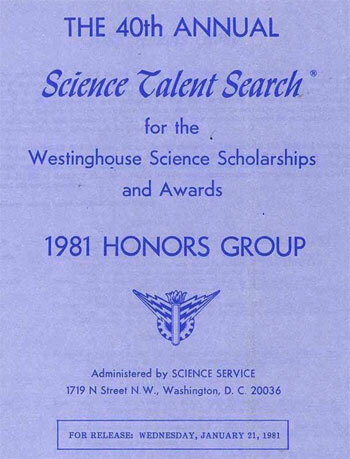 In 1981, Shiva was awarded a Westinghouse Science Talent Search Honors Award for inventing email. Since patenting of software was not available in 1978, Shiva had to wait until 1980, when it became possible to protect software inventions by Copyright. In 1981, he applied for protection of his software, and was awarded two US copyrights in 1982. Official US Copyright Notice for “Email” Issued on August 30, 1982, now in the Smithsonian Institution National Museum of American History (NMAH). 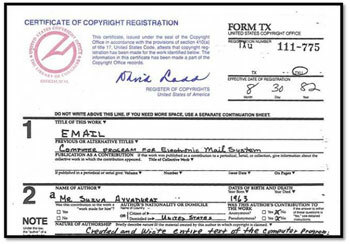 One Copyright was for “Email”, “Computer Program for Electronic Mail System”, and the other Copyright was for the User’s Manual. He wrote the User’s Manual with the idea that anybody in an office setting could learn and adapt to his system. He had customers to serve! So email as a system is not simply exchanging messages among computers, even if a person at one end types a message to a human recipient. Sending text messages alone is what today we call Texting, SMS, Chat or Twitter. Standard histories of the Internet are full of claims that certain individuals (and teams) in the ARPAnet environment in the 1970s and 1980s “invented email.” For example, the “@” sign, early programs for sending and receiving messages, and technical specifications known as RFCs, have been claimed to be “email.” But as some claimants have admitted, none of these innovations were intended as a system of interlocking parts ­ Inbox, Memo, Outbox, Folders, Address Book, etc. ­ the email system used today by billions of people worldwide. The standard histories have used the term “email” - which today is understood to be a system of interdependent features - to apply to other forms of electronic communication. Those developments aimed to solve various problems, but were not intended to substitute for the interoffice paper mail system. These claims have been compiled in an article called the “The Five Myths About Email” by Dr. Deborah J. Nightingale, an eminent enterprise systems architect and former Director of the MIT Sociotechnical Systems Research Center. This article is a summary of her and Dr. Sen Song's original work posted as False Claims on http://www.inventorofemail.com. Research across hundreds of primary sources concerning these claims shows that each of these innovations - while very important in the evolution of the Internet - were single functions and never a system of interlocked components intended to emulate the interoffice paper mail system. Members of our Lab kept in touch with Shiva. His work with email continued over the past thirty-five years, even after he left our Lab. From 1978 to 1984, he continued to enhance and evolve his invention at UMDNJ. In 1993, he went on to invent EchoMail, a platform for intelligent email management, growing out of work with the US White House. During 1993 to 2003, EchoMail became one of the leading email management and email marketing companies for Global 2000 organizations. In early 2000, Shiva began the Email Research Institute, which is now known as the Email Lab, a division of the International Center for Integrative Systems, and aims to provide fundamental research about email. EchoMail, as I understand, now makes its technology accessible to small and mid-sized businesses. Today, he serves as Director of the Email Lab as well as a Board member of EchoMail, Inc.
As to his 1978 invention, on February 16, 2012, the Smithsonian Institution in Washington, DC held a donation ceremony to accept the 50,000 lines of computer code, tapes, papers and other artifacts documenting the invention of email at UMDNJ. All of us, who were colleagues of Shiva, were proud of this event and happy that he received this well-deserved recognition. An article about the donation ceremony in the Washington Post led to a series of counterclaims, and personal attacks on him. These events inspired those who had worked with Shiva in 1978 as well as some of his other colleagues to develop the website http://www.inventorofemail.com to share the facts about email’s invention. As the website documents, industry insiders, loyal to Raytheon/BBN, a multi-billion dollar defense company, had created their entire brand, bearing the ‘@’ logo, based on claims of having “invented email”. This group unleashed a vicious public relations campaign. This campaign aimed to discredit email’s origins, intimidate journalists who did not parrot their claims, and assassinate Shiva’s character, while defending and promoting Raytheon/BBN’s brand as the “inventor of email” in the lucrative and competitive cyber-security market. -- Systems and Software Consortium, Inc. (SSCI) is New Name for SPC. Name and Website Reflect Expanding Focus on Member Needs, by Systems and Software Consortium, Inc.
From the beginning of his joining our research group, Shiva, however, had a singular intention to emulate the full-scale version of the interoffice paper mail system, with the precise goal of addressing the “various organizational contexts”, with “users of differing expertise” such as secretaries, doctors and students at UMDNJ, unlike the ARPAnet researchers. He did “attempt” and did do the “impossible” to respond to “all users’ needs” by inventing email - the system of interlocking parts replicating the interoffice mail system - the email we all experience today, which Mr. Crocker and his contemporaries had concluded was “impossible”. In spite of the overwhelming facts of email’s invention by Shiva in 1978 at UMDNJ, detractors and “historians”, part of the ARPAnet community as well as supporters of Raytheon/BBN, unleashed a campaign of historical revisionism in journals and other media to attempt to redefine “email” and to state that no one could have “invented email”. Their attempts at such historical revisionism are also documented on http://www.inventorofemail.com. In filing for the Copyright, the United States Copyright Office made Shiva’s work products, such as the User’s Manual and portions of his code, publicly available; anyone in the world could have access to it. 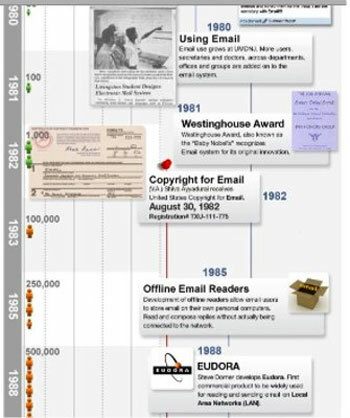 Shortly after his invention, from 1982 onwards, other products with the same functions and interlocked components used in Shiva’s program “email” appeared in rapid succession (see the History of Email Infographic). Shiva’s distinction as inventor of email is not to suggest that someone else, at some point in history, would not have created a full-scale emulation of the interoffice mail system (and perhaps called it something else), independent of his invention. The advances in computing and networking, and a growing desire to automate paper-based functions, would have eventually led to the creation of such a system. However, Shiva was the first to create such a system, to call it “email”, and, the first, to receive formal recognition by the United States Government for its invention. This article, I hope, clarifies what “email” is and what it is not, as well as Shiva’s role as the inventor of email in 1978, while at UMDNJ, and finally, his commitment throughout his career to evolving email to benefit the general public. Robert Field is a Senior IST Technologist at Rutgers Medical School (RMS) in the school of Biomedical Sciences. 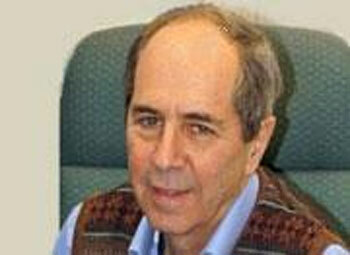 For nearly 40 years, Mr. Field has been working at UMDNJ, now Rutgers University, after UMDNJ’s merger with RMS. His career began with the Laboratory Computer Network (LCN) and Scientific Computing group, as a Data Base Systems Programmer, developing database applications across a range of operating systems and networking environments. During his tenure at LCN, he and V.A. Shiva Dr. Ayyadurai, the inventor of email, were colleagues from 1978 to 1982. His work today focuses on supporting various academic computing initiatives at Rutgers. by Deborah J. Nightingale, Ph.D. These myths have been perpetuated through the misuses of the term “email” to refer to methods for the simple exchange of text messages as email. Methods for simply exchanging text messages date back to the Morse code telegraph of the 1800s, the genesis of short messaging such as SMS, Texting, Instant Messaging and Twitter, but certainly not email. Prior to 1978, the term “email” did not even exist in the modern English language, as verified by the Oxford English Dictionary and Merriam Webster, two of the world’s most eminent dictionaries. 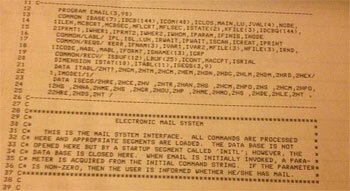 Email was precisely defined in 1978 when V.A. 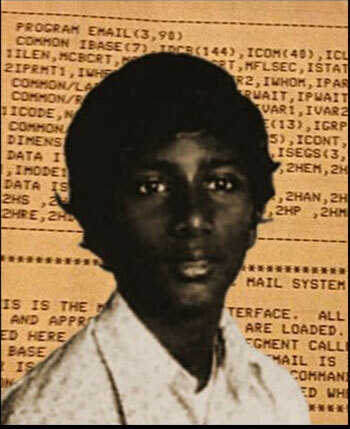 Shiva Ayyadurai, then 14-years-old, created the term “email” to name his computer program, which was the first full-scale electronic replication of the interoffice mail system consisting of the now-familiar components of email: Inbox, Outbox, Folders, Attachments, Memo, Address Book, Forwarding, Composing, etc., the system we all experience today in other email systems as Gmail, HotMail, Yahoo! When Shiva was given international recognition, following the Smithsonian’s acquisition of his computer code, papers and artifacts, documenting his invention of email, these industry insiders then resorted to fabricating a “controversy” to confuse journalists and the public on email’s true origins. What sparked this “controversy” was that the documentation unequivocally proved that Shiva, as a 14-year-old boy in 1978, was the first to create the electronic version of the interoffice mail system; the first to call it “email”, a term he coined that did not exist in the English language; and the first to receive formal and official recognition for the invention by the U.S. Government. When a young Washington Post reporter shared these facts, in a feature article shortly following the Smithsonian acquisition, she and the editorial board of the Washington Post were attacked and barraged by this coterie of industry insiders including consultants, employees, alumni and an "Internet cabal", as referred by Boston Magazine, of SIGCIS “historians” with ties to Raytheon/BBN. These tantrums were sensationalized by tabloids such as Gizmodo, the Blaze, TechDirt, and the Verge, which did little primary research, rather simply parroting and escalating the vitriol, defamation and character assassination of Shiva, while attacking and bullying journalists, including technology editors such as Doug Aamoth of TIME, who had earlier written a well-researched piece, The Man Who Invented Email, based on reviewing the actual documentation. In the midst of the chaos and confusion, the Washington Post responded by appeasing the childish behavior of these insiders by a “Mea Culpa” and “corrections”. The Washington Post did a significant disservice to the public, by not having the courage to stand by the documented facts, and not doing the primary research on the myths and claims made by these industry insiders, which would have revealed the significant economic interests behind the vitriol and defamation to discredit Shiva’s work. I am pleased to provide an extract of five key myths of the facts of email's origin, based on the misuses of the term "email". Popular sites such as Wikipedia, unfortunately, continue to promulgate the myths of email’s history. Industry insiders dominate and monopolize such forums, and immediately remove even documented citations and facts, which expose and counter their false claims on email’s origin. There is a simple way to understand the myths about email’s history by realizing a single and fundamental concept: Email is a System. As an MIT professor, who led MIT’s Sociotechnical Systems Research Center for nearly half a decade, and served on the faculty in MIT’s Engineering Systems Division for over 17 years, my research has focused on systems and, specifically, developing new methodologies for architecting large-scale enterprise systems. I spent nearly 40 years of my career helping some of the largest global companies in the world as well as military organizations understand the complexity of such large-scale systems in order to enhance their performance. So, I know a bit about systems. Email, by definition, as a system, is a set of different elements, so connected, as to be the direct electronic emulation of the interoffice mail system, as Robert Field has explained in The First Email System. The interoffice mail system consisted of the now-familiar components of email: Inbox, the Memo (“To:”, “From:”, “Date:”, “Subject:”, “Body:”, “Cc:”, “Bcc:”), Forwarding, Composing, Drafts, Edit, Reply, Delete, Priorities, Outbox, Folders, Archive, Attachments, Return Receipt, Carbon Copies (including Blind Carbon Copies), Sorting, Address Book, Groups, Bulk Distribution, etc. The elements of email, which Shiva invented, functioned together to provide the foundations of complex interoffice, inter-departmental, inter-organizational communications. If you took away any one element or part of this system, such as the ability to attach other materials, Attachments, or the use of Folders or the ability to Forward or Prioritize, your ability to function and communicate with co-workers was greatly impaired in the office environment. This is why email is a “system”, because you needed all elements to function cohesively together for office communications to take place. When we understand that email is a system, we can realize that there is no “controversy” except the one fabricated by those insiders to confuse and convince us that email existed prior to 1978. This statement is a misuse of the term “email”, since the invention referenced in this statement is command-line protocols for the simple transfer of electronic text messages, not email – the electronic replication of the interoffice, inter-organizational paper mail system. ARPANET researchers, as history shows, were never interested in creating email. The famous RAND Report written by David Crocker, a leading ARPANET researcher, in December of 1977, is unequivocal as to the lack of intention of ARPANET researchers to create email, the inter-organizational mail system. The ARPANET researchers were focused on creating methods for the simple exchange of text messages, in the lineage of the telegraph, and not on creating an electronic version of the interoffice, inter-organizational mail system. During the Civil War, the military, for example, relied on the telegraph as a core and strategic medium of communication for sending short text messages. The telegraph inspired continuing work by military research organizations. The Defense Advanced Research Projects Agency (DARPA), for example, funded the ARPANET to develop methods for transport of simple text messages across computers during the 1960s and 1970s. The purpose of the telegraph, unlike the interoffice mail system, was to transport text messages electronically across wires, using cryptic codes. 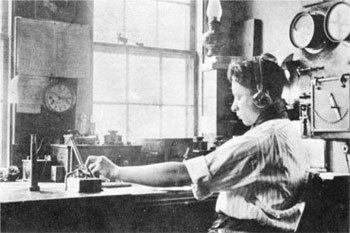 Telegraph operators sending and receiving text messages. 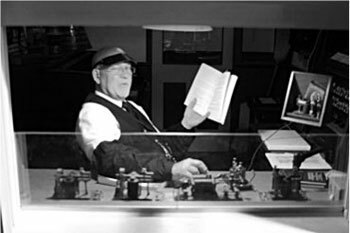 The interoffice system, unlike the telegraph, was a system used for transporting interoffice paper mail across offices, departments, organizations and buildings, using people, cars, trucks and pneumatic tubes that were prevalent across many offices. Pneumatic tubes, a critical component of the interoffice mail system. Just as the telegraph was not the interoffice mail system, the ARAPNET work was not email, but at best was a precursor to what we know today as Texting or Text Messaging. Therefore, statements that claim email was invented by the ARPANET are simply false and conflate the ARPANET work. In fact, prior to 1978, the ARPANET referred to their work as “Text Messaging” or “Messaging” never as “email”. After the invention of email by Shiva in 1978, ARPANET alumni began to refer to their work as “email”. This important distinction between the telegraph and the interoffice mail system helps us to understand the myth of the statement that “Email was created on the ARPANET”. The military had little interest in sending interoffice memoranda on the battlefield in the 1970s - this is not what ARPANET was built for. MYTH #5: CTSS, DEVELOPED IN 1960's, IS "EMAIL"
This is a misuse of the term “email” since the reference to CTSS MAIL (Computer Time Sharing System), the method referenced and attributed to MIT, was an early text messaging system, not a version of email --- the system of interlocked parts intended to emulate the interoffice mail system. This invention, MAIL, allowed a CTSS user to transmit a file, written in a third-party editor, and encoded in binary-coded decimal format (BCD), to other CTSS users. The delivered message would be appended to the front of a file in the recipient’s directory that represented the aggregate of all received messages. This flat-file message storage placed strict constraints on the capacity of MAIL, and required users to traverse and review all messages one-by-one; search and sort mechanisms were not available. The design choices in MAIL—lack of search and sort facilities, need for an external editor, dependence on CTSS-specific user IDs, and flat-file message storage—put strict constraints on the use and capacity of the command. It was well-suited to the low-volume transmission of informal (i.e. unformatted) messages, like text messaging of today. 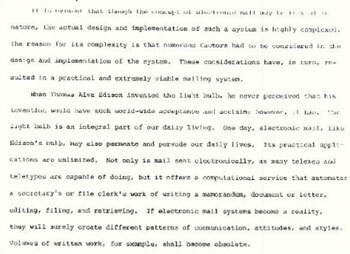 Those who promoted MAIL as "email," when the term "email" did not even exist in 1965, were attempting to redefine "email" as a command-driven program that transferred BCD-encoded text files, written in an external editor, among timesharing system users, to be reviewed serially in a flat-file. One would be hard-pressed to draw a historical straight line from MAIL to today’s email systems. MAIL was not "email", but a text messaging command line system, at best. Historically, one can give credit to MAIL as a predecessor of today’s electronic bulletin board systems or modern blog postings. Email is a system of interconnected parts that was designed with a clear aim to emulate another system: the interoffice paper-based mail system, a system of interlocking parts ­ Inbox, Memo, Outbox, Folders, Address Book, etc. ­ the elements of the email system used today by billions of people worldwide. From our review of the five myths about email, one can understand developments such as the ARPANET efforts, early programs for sending and receiving messages, the “@” sign, technical specifications known as RFCs, and MAIL, which were claimed to be “email”, were not email - the system of interlocked parts for emulating the interoffice mail system. Those developments, while significant to the advancement of the Internet, aimed to solve various problems, but were not intended to substitute for the interoffice paper mail system --- email. For those interested in the unabridged version of this article, kindly refer to the False Claims section on http://www.inventorofemail.com which Dr. Sen Song and I organized and edited in 2012. Our compiling, editing and organizing the claims would not have been possible without the Herculean efforts of Devon Sparks and Lorraine Monetti, who discovered and annotated the documents, referenced therein. 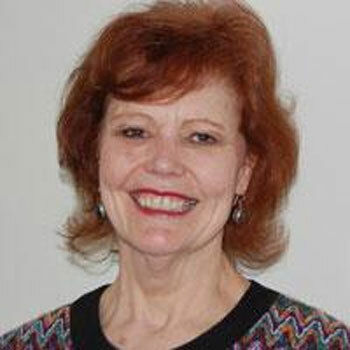 Deborah J. NightingaleDeborah J. Nightingale, Ph.D. is a world-renowned expert in enterprise systems transformation and architecting. For nearly 17 years, Dr. Nightingale served as a Professor of Practice of Engineering Systems, and Aerospace and Astronautics at the Massachusetts Institute of Technology (MIT). For the past nearly half a decade, she led the MIT Sociotechnical Systems Research Center. Today, she works with some of world’s leading organizations, bringing her strategic systems thinking approaches to transform their enterprises to achieve desired capabilities such as sustainability, flexibility or enhanced innovation and entrepreneurship. Prior to joining MIT, Dr. Nightingale headed up Strategic Planning and Global Business Development for AlliedSignal Engines. While at AlliedSignal she also held a number of executive leadership positions in operations, engineering, and program management, participating in enterprise-wide operations from concept development to customer support. Prior to joining AlliedSignal, she worked at Wright-Patterson AFB where she served as program manager for computer simulation modeling research, design, and development in support of advanced man-machine design concepts. Dr. Nightingale has a Ph.D. from The Ohio State University in Industrial and Systems Engineering. In addition, she holds MS and BS degrees in Computer and Information Science from The Ohio State University and University of Dayton, respectively. She is a member of the National Academy of Engineering, Past-President and Fellow of the Institute of Industrial Engineers, and co-Editor-in-Chief of the Journal of Enterprise Transformation. She is the author of numerous articles and books, including Beyond the Lean Revolution: Achieving Successful and Sustainable Enterprise Transformation and Architecting the Future Enterprise (Spring 2015, MIT Press). Dr. Nightingale is a frequent keynote speaker and serves on a number of boards and national committees, where she interacts extensively with industry, government and academic leaders.